Who are the Friends of the Guelph Public Library? We are an arms-length group of community volunteers who believe that the Guelph Public Library is a necessary & vital community institution. We support the goals of the Library. We volunteer to make a great library even better. We promote the Library in the community through special programs, fundraising, and advocacy. Our main fundraiser is our annual GIANT book sale. To date the sale has raised more than $730,000 to assist the library with current programming and to be available for use when a new main library is re-built. It’s time for the Friends membership to update its Constitution. 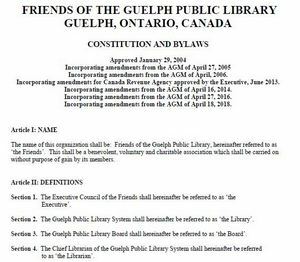 The Constitution of the Friends of the Guelph Public Library, with a number of proposed amendments, can be retrieved by clicking on the document image. Because this is a lengthy document (11 pages) we prefer not to distribute printed copies at the AGM. An electronic version will be projected during the discussion. We hope you will take the time to scan this document now, so you are prepared to vote at the AGM. Anything with a line through it will be removed if the amendments are approved, and anything in red will be added. Most of the changes are merely clarifications in wording. Page 4. Section 5. The definition of a quorum. Page 6. Section 2. The creation of a Board of Trustees to oversee financial activities. These were previously handled entirely by the Treasurer with the support of the executive as a whole. The proposal is now that the Board of Trustees will oversee financial transactions, including investments, and report to the full Executive. As noted, the Board of Trustees will consist of the Treasurer, the Chair, and one other executive member who will be appointed annually by the members of the Executive. Page 7. The inclusion of the Book Sale committee (which has existed from the beginning) as adjunct to the Executive. Elora Festival & Singers volunteers invite you to the 2019 Annual Giant Book Sale at the Elora Curling Club on David Street West. This year’s sale is Friday May 3 (5-9 pm: $5.00 admission includes a voucher redeemable in books Sunday pm); Saturday May 4 (9:30 am-5 pm: free admission) and Sunday May 5 (9:30 am- 4 pm: free admission). To get close to the front of the 5 pm opening line, pick up a priority number at the curling club door any time Friday after 9:30 am. Grand total to date – $745,000 !